Can be controlled by Joypad. Also can support Bluetooth APP control. There are various kinds of Robot cars, such as robot car of tracking, barrier, Bluetooth control, which with different functions and need to adopt different sensors. However, all those Robot cars are basically controlled in the same way, that is, moving in four directions. Here we adopt two-wheel drive structure. By control the rotation of two wheels, we can achieve moving forward and backward, or spinning. Of course, it needs auxiliary wheel to keep balance. This car has a simple structure, including wheels, body and control system. 1)The wheels adopt two speed-down motors with large torque, which can have PWM speed adjustment to make sure easy control. 2)The body of the car adopts wood with a size of 8cm*8cm*8cm. Adopt Microduino-Core as the core. Just like the CPU of a computer, it can analyze and process complicated things. Adopt Microduino-nRF24 wireless communication scheme with fast communication response and the control range of about 50m in the open area. Or adopt Microduino-BT wireless communication scheme, which can work with phone APP to directly control. The control range is about 20m in the open area. 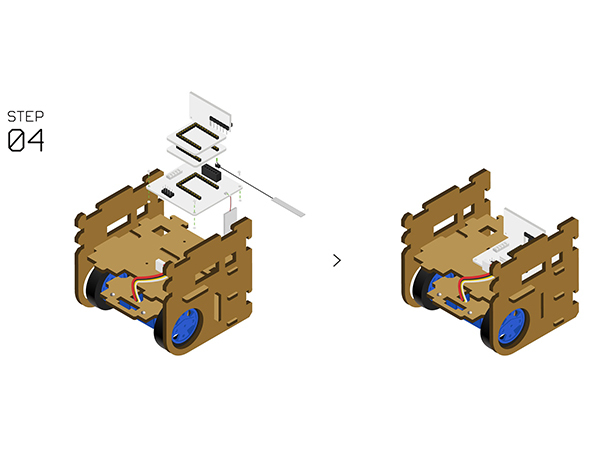 Adopt a group of built-in DC motor drive unit on the Microduino-Robot, and a unit can drive two motors. Adopt a built-in sing-cell Li-ion battery management unit on the Microduino-Robot to manage charging and discharging function. Stack Microduino-Core and Microduino-USBTTL together, then use the USB cable to connect the USBTTL module for program uploading. Note: Please upload programs before stacking all modules together. Open the " Robot_Microduino.ino " program in the downloaded projects. Click "→" and upload the program to the development board. Adopt Motor fixation base to fixate the two N20 gear motors on the Structure-A1. Assemble the Wheels, tyres and Couplings, then install them with the fixated N20 gear motor. Insert Structure-A2 into the slot of the two sides of Structure-A1. Use two Structure-A4 to fixate the bottom of Auxiliary wheel on the Structure-A3. Prepare Structure-A3 and Structure-B1 from up to down as the picture shows below. Fixate theStructure-B2 and Structure-C1 on the two sides. Stack the following modules on theMicroduino-Robot. Connect Battery to the Battery interface on the base of Microduino-Robot. Connect two N20 gear motors to the A.A/A.B motor interfaces on the base of Microduino-Robot. 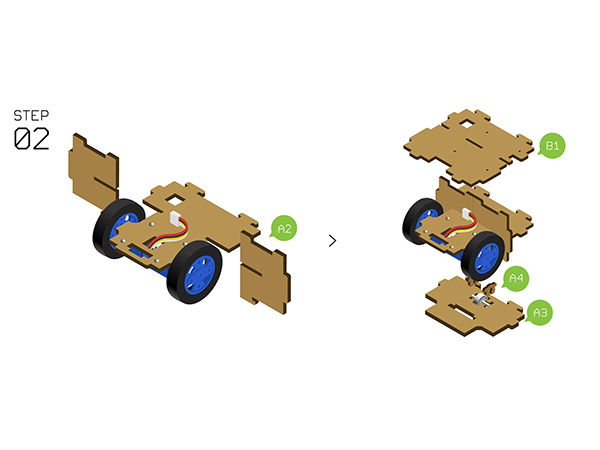 Fixate Microduino-Robot onStructure-B1 with screws. 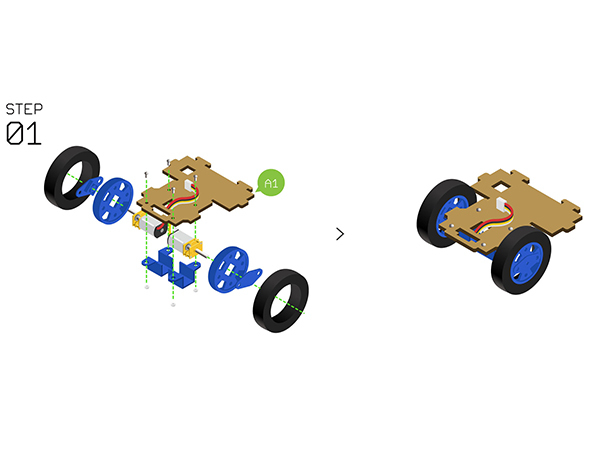 Fixate Auxiliary wheels on Structure-C2 with two Structure-C3. Insert the Structure-C2 to the front side. InsertStructure-D2 to the back side and stick the antenna. Put the Structure-D1 on the top and by here, congratulations! You just completed the installation. If stacking the nRF module and start, the system will enter the Joypad control mode by default, otherwise, it'll enter the Bluetooth mode. When we use Microduino-nRF24 as the communication module, for the Joypad, it can choose nRF mode correspondingly. Confirm that the version of your phone is above Android 4.3 and the Bluetooth is open. Search the Bluetooth device named "Microduino", and connect to it. Then you can control it remotely by APP. Find the configuration file in " user_def.h ". The following codes can configure the channel under nRF mode, which needs to keep consistent with Joypad controller. The following codes can configure the throttle and the corresponding steering channel. The following codes can revise the speed ratio of the two wheels. The range is between -1 and 1. Set as -1, the maximum speed ratio, clockwise. Set as 1, the maximum speed ratio, anti-clockwise. If the car cannot go straightly, you should reduce the speed ratio of the lower wheel. 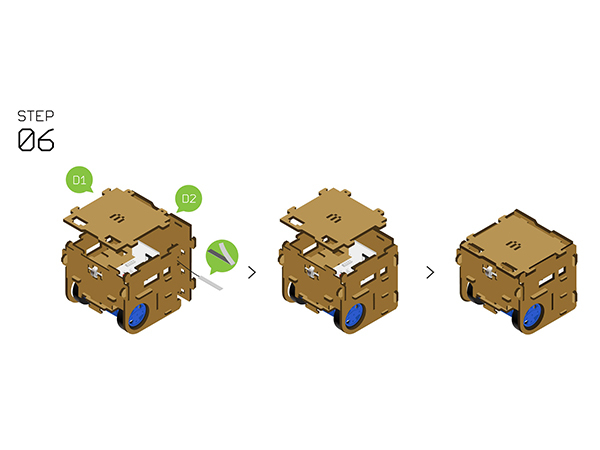 Q:How to choose Joypad mode or Bluetooth mode for this CUBE robot? A:You don't have to select manually but stack nRF24 module when power-on. The system will enter the Joypad mode by default, or it'll enter Bluetooth mode. 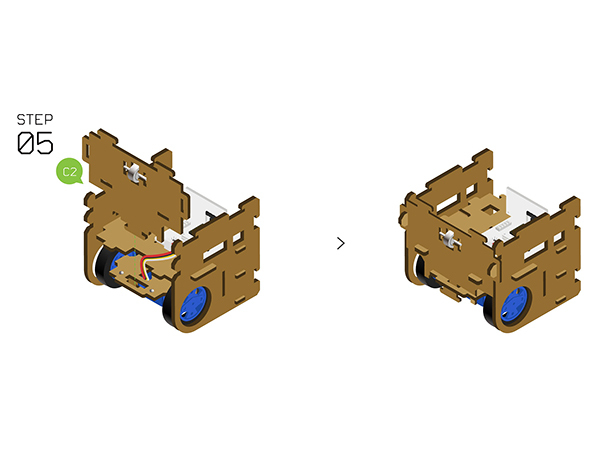 Q:What type of battery does the CUBE robot support? A:It supports 3.7V 1S lithium battery. Q:How to connect the motors? 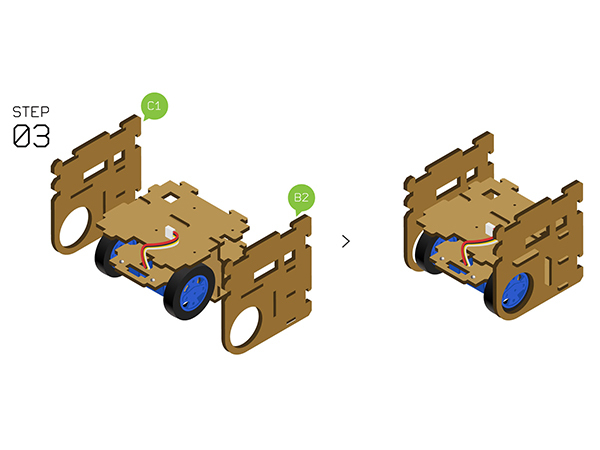 A:You can connect the two motors to the A.A/A.B interfaces respectively. Q:Does my phone support Bluetooth control? A:It is supportable for phones of Android 4.3 or higher. This page was last modified on 30 March 2017, at 03:13.